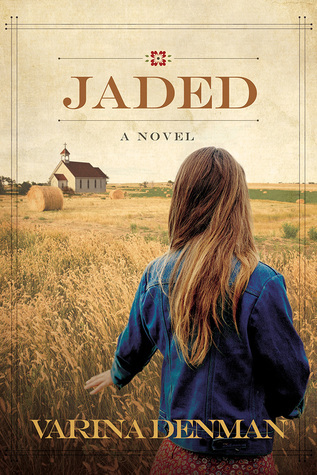 I enjoyed reading Jaded, and it’s one of those books that has hidden depths and layers that become more apparent as the story progresses. Ruthie and her mother live in a small Texan town. She works two jobs to help her mother pay their bills. Ruthie’s father left when she was seven, and her mother was kicked out of their church not long after her father abandoned their family. Ruthie is wary of church people and their judgmental attitudes. Her mother suffers from depression and has withdrawn from the world. Ruthie is embraced and loved by her aunt, uncle and cousin, JohnScott, as she grows up in a town where she’s ostracicised by the church congregation through no fault of her own. Dodd, the new maths teacher at the school where Ruthie works, is also the new preacher in town. Ruthie and Dodd are drawn to each other, despite their differences and Ruthie’s reluctance to date a preacher. Not everyone in town is happy to see Dodd and Ruthie together, and secrets are revealed that blow apart the social perceptions held by many town folk. I highly recommend Jaded to romance readers who are looking for a powerful and challenging romance story that isn’t afraid to delve into the the unsavory aspects of human nature. Readers who have been hurt by the church will identify with Ruthie and her plight in the story. Learn more about Varina Denman and her books at her website. Thanks, Linda! If you read Jaded, let me know how you like it. :) I love hearing from readers. I can’t believe how great Varina Denmans first two books are. She came out strong right out of the gate. Very nice review of the first one, Narelle. Thanks for introducing us to Varina. I look forward to reading Ruthie’s story. Sounds like an interesting story line, Narelle. Is it contemporary? It sounds historical, but maybe people are still that way today…? Hi Valerie, Jaded is a contemporary romance. I haven’t given away any spoilers which would reveal the contemporary elements in the story. The story situation is in many ways more shocking because it’s in a contemporary rather than historical setting. Valerie, I know what you mean. When I first drafted Jaded, I set it in the 80s because I thought things like that didn’t happen any more. But then I began to hear stories about “unofficial” shunnings that happened less than ten years ago. Hush hush. It breaks my heart. Fortunately, I think the church has come a long way, and it doesn’t happen very often any more. At least not as dramatically as Ruthie’s story, but even little incidents are sad. If you read Jaded, please let me know what you think. Modern day shunnings and ex-communications do happen, often with devastating consequences for the people involved and the church community. The issues that can lead to a shunning may be as simple as a church member questioning the doctrine and theology of church leaders, and whether or not the teachings at the church are Biblically sound. It’s very sad. I have both of Varina’s books on my shelf as we speak. I had loaned them to one of my good church friend’s and she said she enjoyed them so much, that she stayed up too late reading them :-) So from her excitement and your review, these will be a treat to read when I get to them! Like you said, too many books….too little time! Thank you for sharing this, Narelle. Definitely another to add to my rather high “To Be Read” list.